And Doxies have their day. Imagine my surprise when I realized I had two different Daschsund scooter swags to post. First up is this beautiful necklace, handmade in Ireland and crafted in sterling silver. The front is 3-D and the wheels even spin, but it’s flat on the back so it sits well. 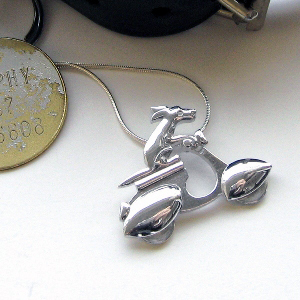 It measures approximately 1.25″ wide and comes on an 18″ sterling silver snake chain. It’s â‚¬99.99 (Euros). 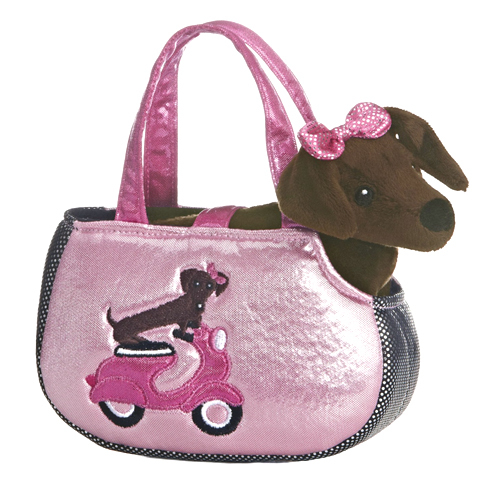 Next up is the stuffed Roxie the Doxie in her own scooter bag. She measures 7 x 3 x 8 inches and costs $12.99.